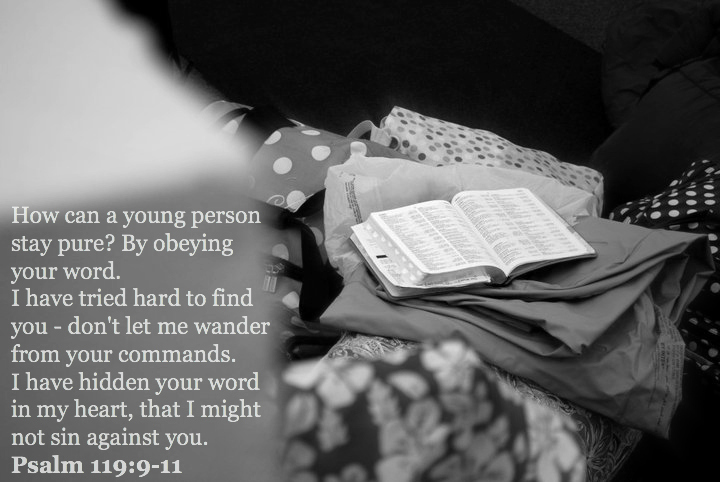 How do you read your Bible? When do you read it? What do you read? I've grown up hearing the Bible referred to as a roadmap and God's love letter to us. But I'm pretty sure that not everyone who reads the Bible will find their way to heaven, and the mauling of 42 teenagers in 2 Kings for making fun of a bald guy isn't exactly the type of love letter I am used to reading (what can I say, my husband has set high expectations for me). Of course, I know what they are intending by saying this. I just think sometimes we limit the Bible to trivial and cutesy phrases, when it is so much more than that. The Bible is all the information I can ever know about God. The power in that is amazing. It should draw us to want to read more of it every day! And yet, I neglect my Bible for days at a time. Only to find it sitting in the backseat of my car or buried deep in my couch underneath a pile of laundry. Some pastor's wife I am. I do read a devotional with two or three Scriptures at the bottom that pertain to the lesson of the day. But I've always felt a little guilty about that. Like I'm using Scripture as a fortune cookie, instead of reading it in context and understanding the whole powerful story. But the days of sitting down and studying my Bible with a pen, highlighter and journal have honestly been few and far between. When I was a single gal (seems like centuries ago now) me and Jesus had a lot of quality time together. We took walks, had picnics, just us. I'm so thankful I went to Bible college and had the privilege of being immersed in it. But looking back, I took for granted how blessed I really was to have that opportunity. I learned so much about God during those years. My season of life and my relationship with God is quite different now, but I don't ever want to stop learning. It's like dating someone and getting to know them, and then getting married and never trying to learn anything else about them. How exciting would that relationship be? Sometimes I feel like that with God. I'm the one in the marriage who has quit trying. He has never stopped pursuing me. I am too focused on taking care of the family and too focused on doing things for Him. He is continually seeking time to just sit down and talk. The longer I am away from Him, the more discontent my heart gets. This relationship is real. And it needs attention like any other one. We have "date nights" reserved for our hubby and are sure to let everyone know how important it is to make that a priority, especially after having kids. How much more should our passion be for God? We need to advocate for that time with Him. Undisturbed, if possible. I know it's hard, I'm struggling too! But I'd love to hear from those of you who have found a way to make it a priority. So I'll ask those first three questions again, and feel free to share your answers below!